It’s time to let it go again, friends! And by let it go, we’re clearly talking about all your excitement for the long-awaited sequel to Disney’s 2013 mega-hit movie Frozen. The first official teaser trailer for Frozen 2 has finally arrived, and it looks epic. In the roughly minute-and-a-half-long montage, Elsa (Idina Menzel) fights through perilous ocean waves to get to what? Or perhaps away from what? We don’t yet know. Her sister, Anna (Kristen Bell), also appears to be fighting against forces not yet revealed. Kristoff (Jonathan Groff) and Sven are there too, charging through what appears to be a forest while surrounded by a veritable army of other reindeer. Other scenes also appear to show the lovable cast of Arendelle characters braving a grim new world. Even Olaf (Josh Gad) seems to be in peril, as he finds himself with Elsa in the center of a ring of encroaching fire — which, naturally, she uses her ice powers against. In other words, it looks amazing. Of course, that’s not to say there aren’t a few questions. As Fast Company points out, it was widely rumored last year that Elsa would be getting a love interest in the sequel: a girlfriend. While no character that seems to match that description is shown in the teaser trailer, that certainly doesn’t mean Elsa won’t find her Princess Charming. 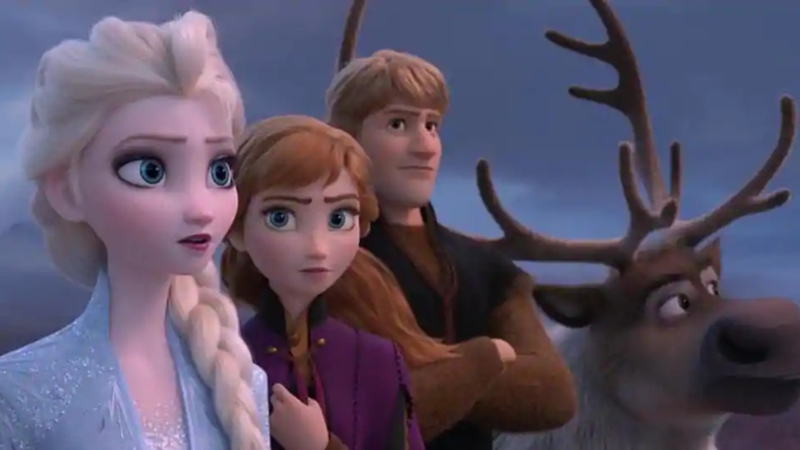 The sequel does very briefly introduce two new characters — a red-haired girl and a blond boy — but fans are speculating they could be the children of Anna and Kristoff. This would make sense, given they appear young and, well, they kind of look like a combination of the two. Plus, it looks like the girl has autumnal powers that mimic that of her aunt’s winter powers. It should come as no big surprise, though, that the internet is already losing its mind over the teaser trailer and impending sequel. Frozen 2 is slated for release on Nov. 22, 2019.